Your big day shouldn't be compromised because of your budget. Thanks in large part to all the over-the-top weddings we see on TV, most couples feel pressured to get married in the grandest way possible. A celebration of love, however, should never be judged by its price tag. Planning a wedding should not be stressful. Make it a more meaningful experience by taking the DIY route: Opt for personalized invitations, double-tap-worthy décor, and handcrafted souvenirs that you and your fiancé would enjoy putting together yourselves. Got a friend who loves to bake? Instead of going to a famous bakery for your wedding cake, commission that friend instead. The perfect cake should be reasonably priced and sprinkled with love! A sophisticated wedding doesn't have to be a big one. Keep it a small yet intimate gathering with only your closest friends and family. It's best to celebrate this new chapter with people who've witnessed your journey as a couple. Peppering your bridal gown with embellishments will cost more, but that doesn't necessarily guarantee sophistication. Something classic, however, transcends the test of time. 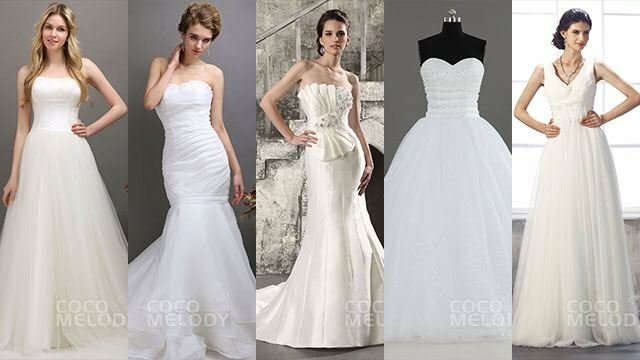 The smartest choice is to walk down the aisle in a wedding dress that's minimalist yet elegant. Good thing CocoMelody is now in the Philippines! This U.S.-based bridal brand offers many options for wedding gowns created with quality materials. You can look like a million bucks on your big day without spending a fortune. For your bridesmaids, pick simple yet elegant dresses that they can still wear even after your wedding. Not only is it practical, they'll also love you for it. Head over to Lazada to start your wedding preparations! To learn more about CocoMelody Philippines, follow them on Facebook and Instagram. Visit CocoMelody Philippines at Unit 604-A 6th floor, Vicente Madrigal Building on Ayala Avenue, Makati. The bridal shop is open via appointment from Mondays to Sundays, 9 a.m. to 9 p.m. Contact Jessy via landline (02) 869-6141 or mobile 0956-542-5925. This article was created by Summit Storylabs in partnership with CocoMelody.